Above - The Rusholme Theatre, Manchester - A detail from a contemporary postcard circa 1915 - Courtesy the Rusholme and Victoria Park Archive. 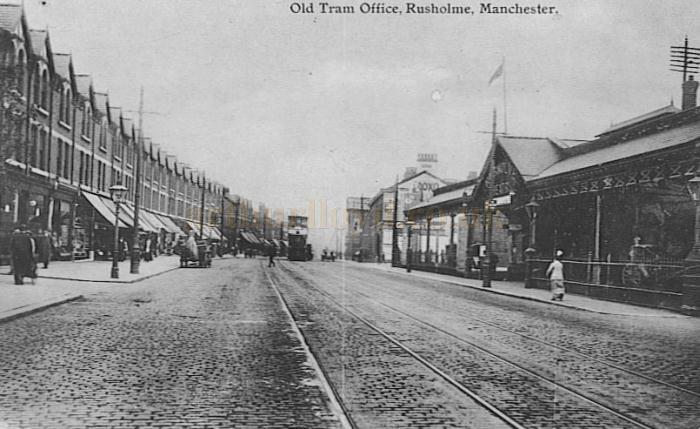 Above - The Old Tram Office, Rusholme, Manchester in 1909 - Later the Rusholme Theatre - Courtesy the Rusholme and Victoria Park Archive. The Theatre was used as a Cine Variety house for a number of years until its audiences began to slacken off in the early 1920s. See Bills Below. Above - A Bill for the Rusholme Theatre during its Cine Variety years circa 1916 - Courtesy Bruce Anderson, Rusholme Archive. The performance featured 'High Class Cinematograph' with an Overture, Gaumont Graphic News in Pictures, Paramount Travel pictures, Gladys Allen, F. Lupton, Harry Liston, A Day in Tuscany (Scenic), Freddy's Narrow Escape (Comedy), The Vicar of Wakefield, and a Trio performing 'Ave Maria'. In 1924 the Theatre was taken over by the Manchester Repertory Company (See article below) who ran it successfully for many years. However, eventually the popularity of Cinema really took off and the building was converted for full time Cinema use. The end finally came for the Rusholme Theatre when the building was demolished in the 1970s to make way for a petrol station. The repertory movement, chased out of Manchester by the cinema, has stolen back again. True, the Gaiety scene of Miss Horniman's activities and the famous old Theatre Royal still plaster their sober fronts with shrieking film appeals, and the former street of theatres remains as barren as ever. It is to the suburbs that the movement has come seeking a home. One might have imagined that it could not have come in more unpromising fashion or to a more unpromising place. There was no preliminary "boosting," no effort to enlist the sympathy of recognised bodies of playgoers, and no request for financial assistance or guarantees from anybody. The theatre was originally a tramway-car shed, and recently a struggling cinema and variety house, and its exterior still hints rather broadly at its humble origins. It is situated in a cinema-ridden district of lower middle-class people and artisans, between two and three miles from the nearest city theatre. Right - Rusholme Theatre details from a Programme for 'Baa, Baa, Black Sheep' A farcical comedy in three acts by Ian Hay and P. G. Wodehouse, at the Rusholme Theatre in June 1932. It began its work in obscurity nearly two months ago. Even the newspapers seemed unaware officially of its existence. Money was too scarce to he lavished on advertising, During the first four week, the Company played for the most part to empty space. 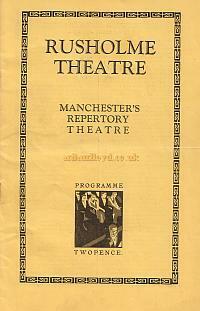 Mr. Arthur W. Belt, the manager, carried on in the belief that in Manchester there was a public for the play, and that a repertory theatre was a commercial proposition. He was convinced that was not a bad thing to set down a theatre where the people lived, and that there was nothing meritorious or pleasant in the tedious journey to and from a city theatre. The past fortnight, during which Manchester seems to have begun the process of discovering the Rusholme Theatre, looks like justifying Mr. Belt's optimism and- also supplying an argument for not one, but two or three suburban theatres. 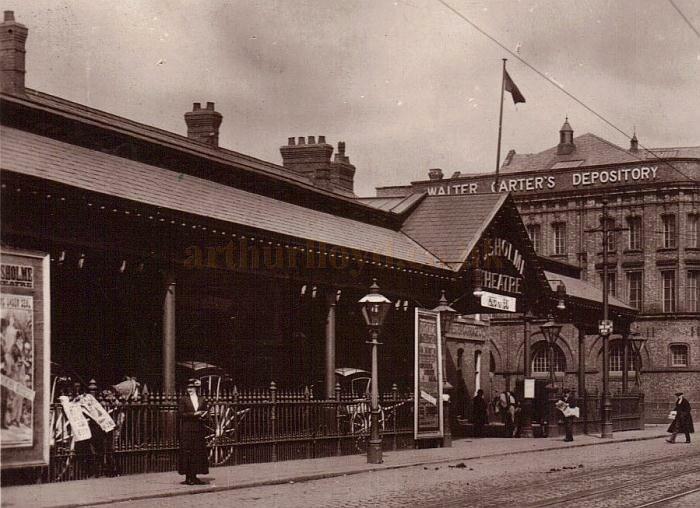 Now that the venture appears to be assured of success Mr. Belt is hurrying back as quickly as his resources will permit to the standard set by Miss Horniman at the Gaiety. He has already assembled a competent company under the experienced leadership of Mr. W. H. Dewhurst. Miss Davies, who has joined the company, was a favourite player at the Gaiety, and Miss Dorothy Dewburst has come from the Liverpool Repertory Theatre. These are the plays which the company will give in the next six weeks: "Passers By," by Haddon Chambers; "Hobson's Choice," by Harold Brighouse; "The Case of Lady Camber," by H. A. Vachell; "TheLiars, " by H. A. jones; "A Woman of No Importance," by Oscar Wilde; and " Helen with the High Hand," by Arnold Bennett. At present the theatre consists only of a rather small stage and a long, steeply sloping auditorium, but it is the intention of the management to provide more amenities for the playgoers as time goes on. Left - Programme for 'Baa, Baa, Black Sheep' A farcical comedy in three acts by Ian Hay and P. G. Wode0house, at the Rusholme Theatre in June 1932. 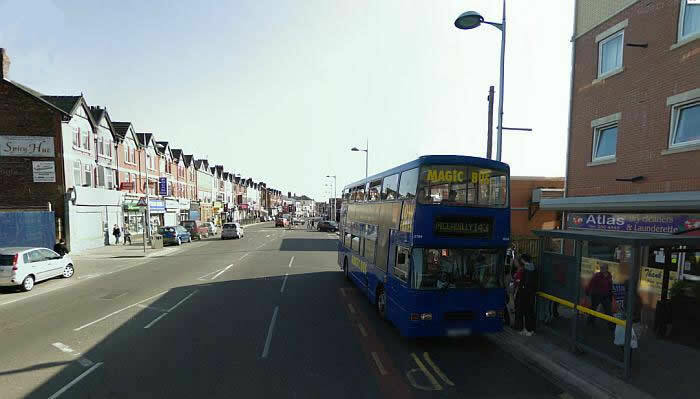 Ian Hay was born in Rusholme, see details here. Manchester is beginning to take a zestful interest in the experiment which may also have its lesson for other towns. 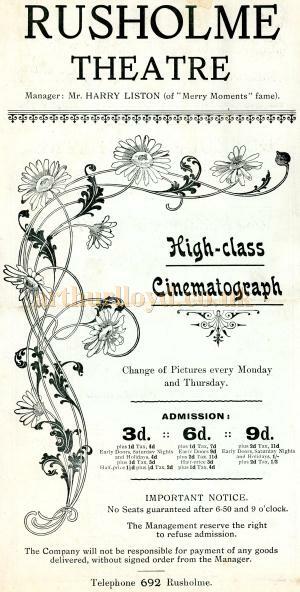 One result of reviving repertory in a residential suburb and of charging picture-house prices (the dearest seat has been two shillings) is that people with the cinema habit have been induced to visit the theatre and have been weaned for a period at least from their single-hearted devotion to the films. In this way it would seem a new public is being recruited for the theatre. The above text is from an article printed in a programme for Bristol's Little Theatre in 1924 and is credited to the Observer, London. You may also be interested in Harry Leslie's Rusholme Pavilion, details of which can be found here.